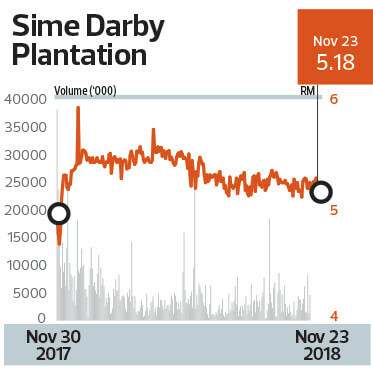 AS crude palm oil (CPO) prices have hit historic lows of late, Sime Darby Plantation Bhd (SDP) is poised to see more strain on its balance sheet in the coming months than was previously thought. The planter is now looking at more land disposals to close the cash gap. That may ease the need to gear up, although the company is keeping its borrowing options open, it told a media briefing last Friday. Back in September, Moody’s Investors Service noted that SDP’s expected operating cash flow and cash balances would not suffice to meet its projected cash uses between July 1, 2018 and June 30, 2019. In those 12 months, SDP is expected to need at least RM2.81 billion, Moody’s analyst Maisam Hasnain tells The Edge. That estimate does not include the dividend payout for the financial year ended June 30, 2018 (FY2018), which may total RM1.1 billion to RM1.2 billion. However, “the cash outflow for dividends will likely be lower than this amount, given that SDP plans to establish a dividend reinvestment plan (DRP), in which shareholders can reinvest dividends for additional shares”, he says. In comparison, its operating cash flow is projected to come in at about RM2.3 billion, assuming CPO prices average at RM2,300 per tonne, says Maisam. But CPO prices have not gone above that level on a monthly basis since June. Instead, they have steadily weakened and hit a nine-year low of RM1,716 on Nov 21, a level not seen since late 2008. Last Friday, SDP’s quarterly financial release indicated that the shortfall may be more than initially expected. For the three months up to Sept 30, 2018, SDP reported RM115 million in recurring net profit, a 57% drop year on year, as revenue slipped 14% to RM3.04 billion. Its operating cash flow was RM391 million, 27% lower y-o-y and just 17% of Moody’s projected 12-month figure. Note that SDP is undergoing a change in financial year end to Dec 31 and this quarter is part of a six-month transition period to a new financial year ending Dec 31, 2019 (FY2019). SDP attributed the profit drop to weak realised CPO prices that averaged 21% lower y-o-y at RM2,117 per metric ton (MT) over the three-month period — partly mitigated by a 2% fresh fruit bunch (FFB) output improvement and a marginal increase in oil extraction rate. According to chief operating officer for upstream, Mohamad Helmy Othman Basha, SDP’s ex-mill cost for a tonne of CPO was roughly RM1,185. Its overall output cost-to-customer was RM1,550 per MT. That said, Moody’s expects SDP’s balance sheet to remain resilient despite the additional strain, anchored by strong fundamentals as it is among the largest listed CPO producers globally. “While we expect credit metrics to weaken slightly over the next 12 months, in part due to lower CPO prices, we expect SDP to maintain a credit profile supportive of its Baa1 rating and stable outlook,” says Maisam. “Its Baa1 rating ... also reflects the company’s position as an integrated palm oil producer, with the ability to benefit from the favourable long-term demand fundamentals of the industry,” he adds. However, SDP sees some silver linings on the horizon. At the media briefing last Friday, executive deputy chairman and managing director Tan Sri Mohd Bakke Salleh said he expects CPO prices to “have bottomed out”. Prices are seen to recover to range from RM1,900 to RM2,200 till year-end before firming up further in the first half of 2019, he said. “Prices should be firming up and trend higher in the first half of 2019, probably around RM2,200 to RM2,400 in the first quarter and RM2,400 to RM2,600 by June, as demand is expected to pick up due to the seasonal factors such as the Chinese New Year celebrations and Aidilfitri,” Bakke added. Recovering CPO prices would narrow the cash shortfall ahead. That said, SDP will still need to raise additional cash unless CPO prices shoot up to historic highs in the very near future. According to its latest quarterly release, SDP has RM7.16 billion in total borrowings on RM16.54 billion in equity, translating into a gearing ratio of 43%. When asked how much SDP can comfortably borrow, Bakke says SDP is keeping its options open but expects its gearing to remain at that level until December at least. “For now, we are looking at around 43% to 45% till the end of the year. But for next year, there will be certain transactions that we will work on that will see us disposing of our non-core assets or even parts of existing estates that had been identified for development,” he says. While Bakke is tight-lipped on which assets could be up for sale, the company’s asset monetisation drive will likely mitigate the need to gear up too much if successful. On Nov 15, Fitch Ratings outlined expectations that SDP’s land disposals would drive a long-term debt reduction and lighten up its balance sheet despite a near-term cash crunch. The ratings agency noted that SDP’s debt-reduction drive in FY2018 had already exceeded its expectations as net leverage fell from 3.7 times (FY17) to 3.2 times. It initially forecast 3.5 times net leverage in FY2018. “Fitch expects SDP to dispose of more land parcels over the next 24 months, supporting our deleveraging expectation towards funds from operations adjusted net leverage of below 2.5 times by FY2020 (FY2019: 3.0 times; FY2020: 2.4 times),” it said. Internally, SDP is also trimming some of its expected expenses in the 12 months up to June 30, 2019, says chief financial officer Renaka Ramachandran. For perspective, from the RM2.18 billion in estimated cash requirements by Moody’s, approximately RM1.5 billion is for capital expenditure, RM1.09 billion for scheduled debt maturities and RM216 million for the acquisition of Papua New Guinea planter Markham Farming Company Ltd (MFCL). The MFCL purchase payment was completed in the quarter ended Sept 30, 2018. Renaka says SDP is cutting back on capital expenditure in response to lower CPO prices and is budgeting RM1.3 billion instead. Dividend-wise, the DRP is expected to see at least 70% take-up, which will reduce the actual cash payout to approximately RM330 million. SDP also defended its special dividend of three sen per share for FY2018 on top of an eight sen dividend per share, which at the time raised eyebrows given the cash needs looming. “The special dividend was a one-off distribution of non-recurring income and took into consideration that we were going to propose the DRP. Hence, the actual cash payout was never meant to be significant,” Renaka said.